In writing my glowing reviews for all of my vendors, I saved Silverbrook Farm for last because I honestly don’t know where to start! It was the most perfect venue that I can possibly imagine for my wedding. The house, barn, and gardens are absolutely beautiful and the views are stunning- I haven’t gotten my pictures yet, but I know that they are going to be amazing given the tremendous beauty of the place. It is so clearly a labor of love. What made my experience with Silverbrook Farm so outstanding, though, was truly the opportunity to work with Dot, the owner, and Lynn, my day-of coordinator. Throughout the entire planning process, both Dot and Lynn were responsive, professional, and coordinated perfectly with my other vendors (most of whom came recommended by Dot). As I was planning my wedding from out-of-town, this was so important to me- I never felt like I needed to worry about a thing. Dot and her team know how to plan a wedding, and they were so gracious in sharing their expertise with me and my parents. Dot also has an amazing collection of decor- everything from vases to bird cages to furniture- so I had to purchase very little for my wedding. In hindsight, we can not imagine having had our wedding anywhere but Silverbrook. Dot has an incredible and gorgeous property that was the perfect backdrop for our ceremony and reception, and Lynn and Sherri did an outstanding job as day of coordinators. They are all three extremely nice and very easy and pleasant to work with. Silverbrook would be the perfect choice for a wedding on those strengths alone, but Dot really goes above and beyond to give couples a perfect weekend, including plenty of time to set up and prepare leading to a much less stressful experience. She was generous in allowing us to use items from her extensive collection of wedding decorations, and between that and the beauty of her property, we barely needed to do much decorating on our own. We also held our rehearsal dinner Friday evening at Silverbrook, which was a much more relaxed, comfortable, and enjoyable setting than if we had had to do it a restaurant. My husband and I spent several months looking at barn venues in MD/DC/VA and Massachusetts for our wedding — we saved Silverbrook for the last visit and fell in love immediately! Silverbrook is one of the most spectacular and special places I have ever been to. The natural beauty of the land surrounding the outdoor ceremony site, home, and barn is breathtaking. The barn blends rustic charm and elegance. If you are lucky enough to spend a night at the B&B — the breakfast is also fabulous! However it’s not just the beauty of the land and barn that makes Silverbrook such a wonderful place to hold a wedding — the owner truly makes you feel that Silverbrook is your home during the time you spend there. She helps to support the couple and their family in whatever ways she can. She is also incredibly knowledgeable about nearby B+B’s and vendors that she has worked with in the past. My husband and I instantly fell in love with this venue for our wedding! Even in the dead of winter, we could envision how beautiful our fall wedding would be at Silverbrook. The sweeping views of the hillside were inspiring, and all the creative gardens added a lot of charm. It was an ideal location for our ceremony and cocktail hour. 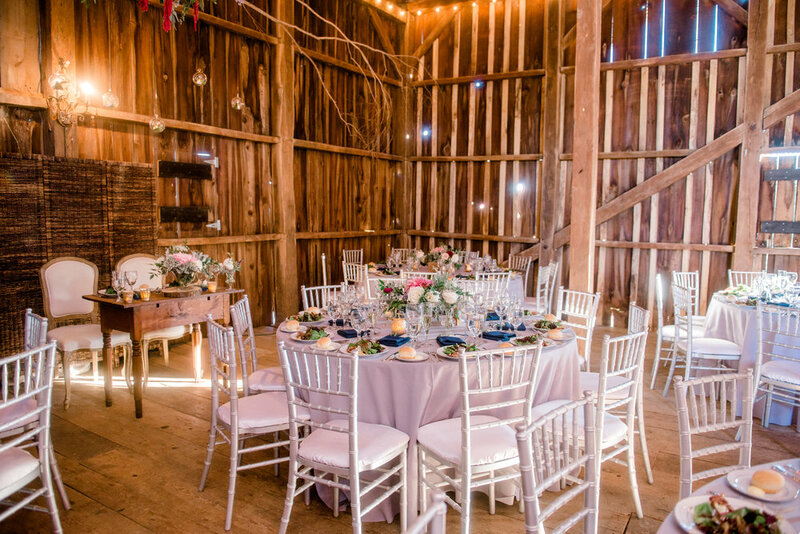 The barn had its own rustic charm and was perfect for our reception.